This quick tutorial aims to show you the steps required to set up the pcDuino WiFi Dongle with everyone's favorite fiberglass-flavored development board: the Raspberry Pi (model B or model A). This WiFi dongle is a cheap solution to adding network connectivity to your Pi, if you don't have Ethernet nearby. It's easy to set up, once you get the hang of editting text files and typing Linux commands. It's not quite plug-and-play-easy, but it's easy enough. 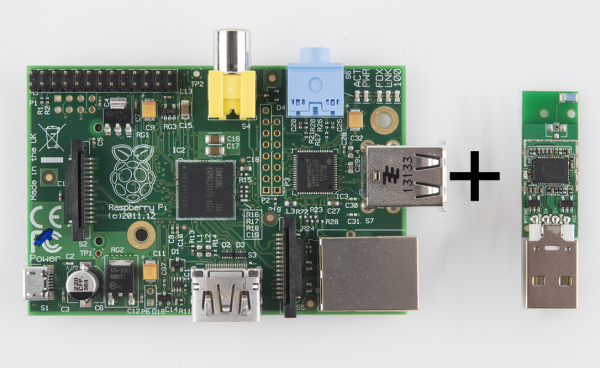 This tutorial assumes you have Raspbian installed on your Pi. If you haven't gotten that far, head over to our Setting Up Raspbian tutorial first. This tutorial is all terminal based. Unfortunately, we haven't been able to get the GUI-based WiFi Config utility to work. So flex your typing fingers and/or prepare to copy/paste a lot of command lines! Find an open USB slot. Plug the WiFi Adapter into USB slot. The trick is finding a USB slot on the Pi. It's only got two, and those are often swallowed up by a keyboard and mouse. If you're out of available USB slots, you'll need to find a powered USB hub to get more USB space. 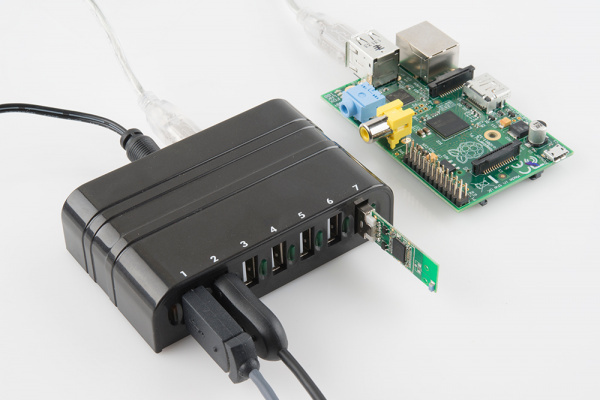 A powered USB hub serves the USB keyboard, mouse, and WiFi adapter. It also helps to offload a lot of the Pi's powering duties. Make sure the hub is powered. 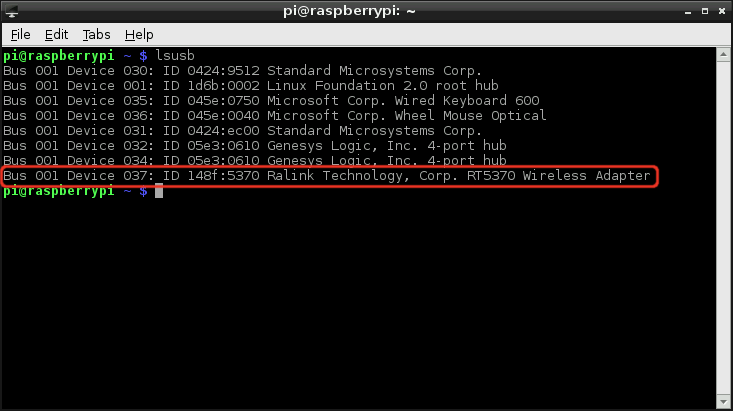 The WiFi adapter can pull a lot of current, which the Pi isn't especially well-suited to sourcing. Note: It's possible to perform this setup with solely a USB keyboard, plugging that and the WiFi adapter into the Pi's USB sockets. We generally recommend against this, as the WiFi adapter can pull a lot of current and potentially damage the Pi. Attempt at your own risk! This will list all USB devices attached to the Pi. Among other things, like your keyboard and mouse, you should see a listing for a Ralink Technology Corp. RT5370 Wireless Adapter. That's the WiFi adapter, and it's a good sign if you see that. It means the adapter has been recognized, and the RT2800 USB driver should have been installed for it. /etc/network/interfaces -- Configures DHCP (or static) and tells the wireless utility where to look for your authentication settings. 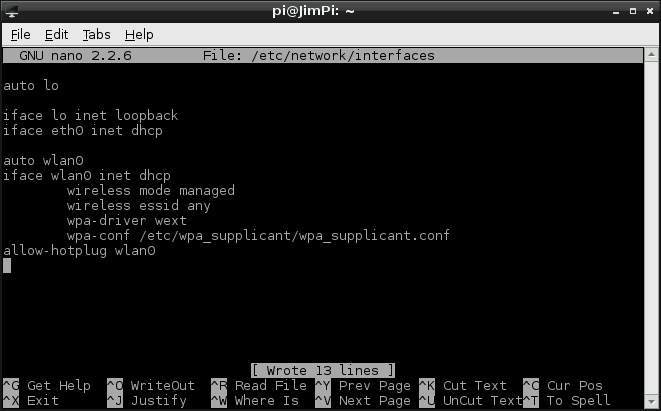 /etc/wpa_supplicant/wpa_supplicant.conf -- Stores your wireless network's SSID and authentication settings. To edit both of these files we'll use Nano, Raspbian's default terminal text editor. The default interfaces file layout. First delete or (if you're a digital packrat) comment out the bottom three lines (iface wlan0 inet manual, wpa-roam /etc/wpa_supplicant/wpa_supplicant.conf, and iface default inet dhcp). This is a fairly generic configuration that sets the Pi up to receive an IP address dynamically, through DHCP. Make sure to modify the IP addresses to match the needs of your network. Now that our network interface is configured, the next step is to specify the SSID and authentication parameters, which we'll do in wpa_supplicant.conf. 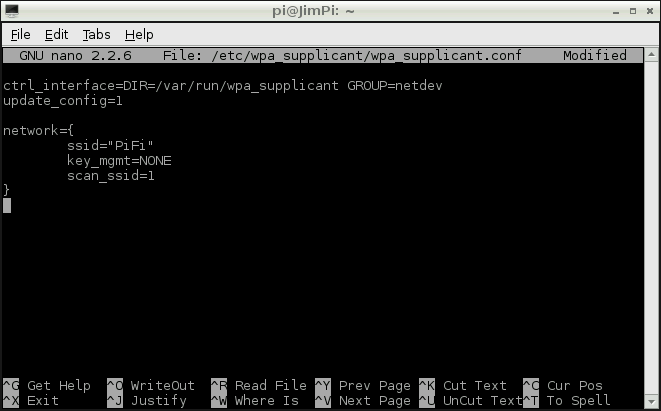 wpa_supplicant.conf is a configuration file for wpa_supplicant, a piece of software used to implement WPA and other security protocols that WiFi networks implement. Before continuing on, you should know what kind of security protocol (WPA, WPA2, WPA-PSK, WPA2-PSK, etc) your network requires. And, obviously, you'll need to know the name (SSID) of your network as well. Lot's of typing! For lazy folk, don't forget you can press Tab to ask the terminal to try to finish a directory location for you. Leave those be, we'll be adding some extra information below them. Just replace yourNetworkSSID with your WiFi network's name. Again, pretty bare bones. This should work for networks using WPA and WPA2-PSK, and should be agnostic to the cipher (TKIP, CCMP). This will connect to a hidden network named PiFi with open authentication. There are all sorts of options to be added to this configuration list. You can enforce which cipher is accepted, set up priorities, private keys, etc. For a really great breakdown of everything you can add to wpa_supplicant.conf check out this page. After editing wpa_supplicant.conf make sure to save, and exit. If you hit CTRL+X it'll prompt you to save before you exit. The final step is restarting the network interface. Cross your fingers, and hope that all of the settings here are correct, then jump the penultimate page. The last step, after you've modified interfaces and wpa_supplicant.conf is to restart the wireless interface. You'll either get a response that DHCP was released, and the interface has been disabled, or (more likely) the Pi will tell you that it's already down. Fine! Just making sure. Now you should see lots of text start to scroll by as the Pi attempts to connect to the network listed in the configuration file. This is the real test. If everything you configured on the last page is correct, the last message before returning your command of the terminal should be something like bound to 192.168.0.101 -- renewal in 398425 seconds. There's your IP, and confirmation that you've connected to the network! 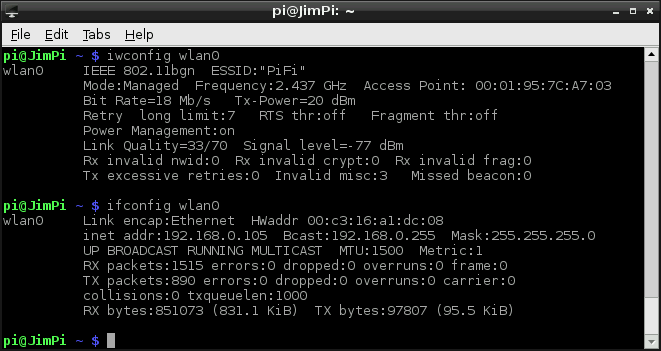 Response after ifup wlan0. Great success! 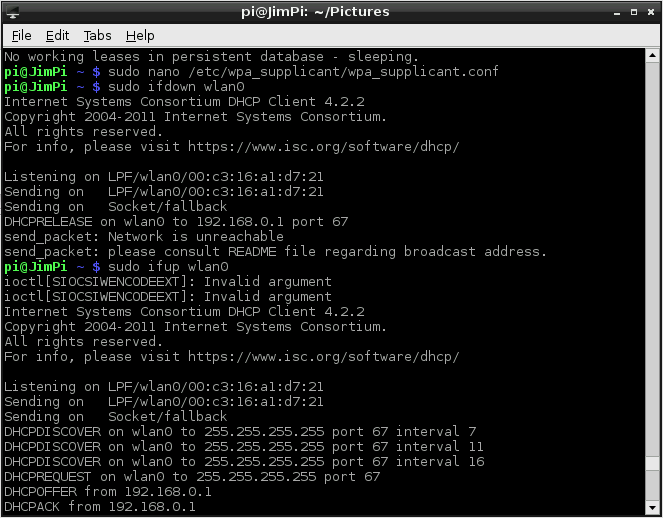 If you ever forget your IP address, type ifconfig wlan0 into the terminal to be reminded. You can also try iwconfig wlan0 if you want to find out some statistics and other settings related to your wireless interface. If you just want to verify whether you're connected to the Internet or not, ping and traceroute are great utilities. Try ping -c 4 sparkfun.com, and hopefully you'll receive four, healthy, fast responses. Or download and play Doom!